Newport House is a perfect base for a wide range of outdoor persuits. It is situated overlooking the estuary of the Newport River where it flows into Clew Bay and is within easy reach of some of Ireland's most beautiful lakes, mountains and coasts. Newport House is famous as a fishing centre and holds the fishing rights to the internationally renowned Newport River (fly fishing only) with 8 miles of river (both banks) and Lough Beltra West - 3 miles by 1 mile. 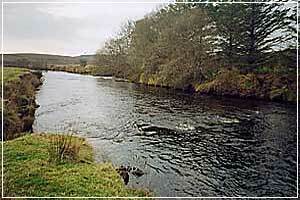 The fishery holds a healthy stock of Spring Salmon, Grilse and still some Seatrout and all of our fish are wild. We do not stock or ranch the system leaving it to nature to restock and catches are consistent with a wild fishery. It is one of the few fisheries in Ireland where Spring Salmon can be fished from a boat. The spring fishing opens on the 20th of March and continues through June when the Grilse (Summer Salmon) begin to show. There is often a run of bigger fish at the end of the season in September. The river has 24 named pools with well maintained stiles, bridges and crossings making it easy to negotiate. It is fished from the bank so there is no need for wading. The number of rods is strictly controlled to ensure fishing privacy. A river Ghillie is usually available on request. A detailed map of the system is available from the fishery manager. The lough is situated 180 feet above sea level and is fished from a boat with a Ghillie (guide) with up to two rods per boat. Fishing is from 10am to 6pm and again is fly fishing only. Usually a 10/11' salmon fly rod (weight 7/8) is used (we have a limited number of rods for rent) with floating/sinking/sink tip lines depending on the conditions. Flies tied by Peter O'Reilly are available at the House. The classical range of flies are used including the Beltra Badger, Silver Doctor, Hairy Mary, Lemon and Grey, various Shrimps among others. A basket lunch is available and the hotel provides a drying room, freezing facilities and smoking of your catch can be arranged. Only 20 minutes drive from the House are the attractive Loughs of Feeagh and Furnace (home of the Marine Institute of Ireland) and the reputed Loughs Mask and Corrib are within an hours drive. 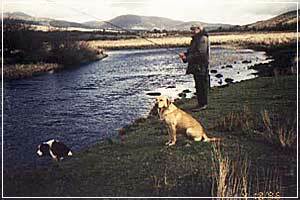 Fishing on the prolific River Moy can be arranged. Clew Bay is an important centre for Sea Angling and this can be arranged be Newport from the Newport Quay as well as Westport and Achill Island. Family outings also can be made amoung the beautiful islands of Clew Bay. Our angling guests can now keep 3 salmon (1 per day) prior to 11 May 2019. After which time anglers are allowed to retain 3 salmon per day up to a maximum of 10 salmon per season.